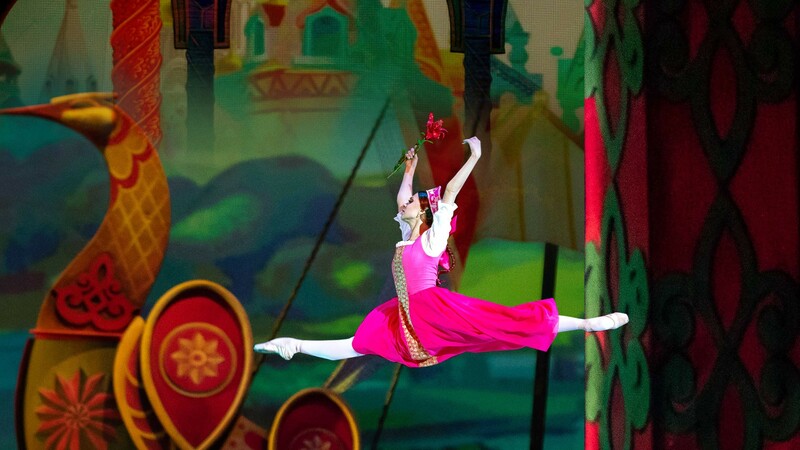 The Scarlet Flower: Performance of the "Kremlin Ballet": (on January 13, Sunday) in THE STATE KREMLIN PALACE. Purchase of tickets. & #9742; +7(495) 620-78-46. Nutcracker. Performance of the "Kremlin Ballet" Nutcracker. Performance of the "Kremlin Ballet"
Vivid ballet images are created by means of colorful scenery, wonderful costumes, expressive choreography. This magic ballet in two acts is intended for family viewing: , its fairy-tale plot is comprehensible and interesting for children , and adults will also enjoy meeting with the long-loved and familiar from childhood Russian fairy tale about the victory of good over evil. Duration: up to 2 hours 30 minutes (with intermission). In a dense forest, behind the impenetrable thicket on a meadow there is a green mound. On its top grows a beautiful scarlet flower. This flower is not ordinary, it is magic. It emits very strong invisible waves: vibes of love and loyalty for pairs destined for each other. That is why men and women, girls and boys are looking for this scarlet flower, hoping that it will help them find their couple and happiness. Scarlet flower cannot help only the witch. Prince Charming rejected her for her malice. Therefore, the witch turned the young prince into a terrible beast and put a spell on him to guard the scarlet flower forever. Wealthy merchant Ivan Vasilyevich is leaving to trade overseas: he and his friends are loading the ship. Meanwhile, people gather at the pier to give merchants a send-off. Among the gathered are the daughters of the merchant. Before the ship departs, the daughters ask the father to bring them expensive gifts: the eldest asks for a golden crown with gems, the middle sister wants pearl beads. Only the youngest does not ask for anything. Nevertheless, Ivan Vasilyevich insists, and Nastenka finally tells him about her dream, which does not give her rest. She saw a scarlet flower in this dream, which is prettier than anything else in this world. Nastenka asks her father to bring this flower from overseas to her. Father promises to fulfill the wishes of his daughters and together with other merchants sets off with the sails raised. The oriental bazaar is in the usual motion and bustle: merchants smartly pitch customers to come in demonstrating their goods. Chinese girls with fans, beautiful oriental dancers, everything attracts curious passers-by. Pearl divers are also an object of attention. Meanwhile, Ivan Vasilyevich, who sold the goods at a good profit, is looking for gifts to his daughters. He fulfilled the orders of the elder and middle daughters, but what the younger daughter asked for, he cannot find. Nobody even heard about the scarlet flower. Upset, the merchant embarks on the ship and together with the companions sails home. The wicked witch does not slumber: having learned about the interest of Ivan Vasilyevich to the scarlet flower, she decides to ruin the merchant; because of her charms and conspiracies, he will not be able to reach his native shore. The ship gets into a strong storm: lightning strikes her masts, wind tears her sails. The ships rolls and Ivan Vasilyevich falls into the raging sea. The ship floats away, but the merchant manages to escape; the wave throws him onto an unknown shore. Ivan Vasilyevich wakes up on an unknown island, in an enchanted forest. On a mound before him, there is a beautiful palace. There are many magic flowers and butterflies in that palace. The merchant is treated to delicious foods. They dance in front of him. However, the owner is nowhere to be seen. Suddenly, on a mound, which is in the middle of the meadow, Ivan Vasilievich sees a flower, which can be named the most beautiful in the world. From the flower is so amazingly radiant that the merchant understands: this is the scarlet flower. Ivan Vasilyevich comes to the flower and as soon as he wants to pick it, suddenly, as if from under the ground, a terrible Beast appears and grabs the merchant by the hand. The beast threatens to punish the merchant by death for his audacity, but Ivan Vasilyevich prays the beast to let him go, because he wanted to bring this flower to his younger and beloved daughter, Nastenka. The Beast listened to the merchant and offered him a deal: it will give him the flower and return Ivan Vasilievich home, if he would send one of the daughters back to him, but if the daughters refuse, then the merchant will have to return to the Beast himself. … he wakes up at home. Here he stands in his upper chamber with a flower in his hands. Daughters meet their father, they are glad to receive presents. Here are the companions of the merchant; they are the grooms of his daughters: their ship has safely reached the native shores. Ivan Vasilyevich is extremely happy. Everything seems to be all right, but only he does not know how to tell daughters about his deal with the Beast. ... finds herself in a beautiful garden. The sun is shining; birds of paradise are flying in the air. The girl puts a flower on the green mound. Suddenly, she hears charming sounds, goes in their direction and finds herself at the portal of the palace. Doors swing open, and on the threshold, beautiful fairies meet her. They invite the girl to a table full of delicious foods, and are ready to fulfill all her desires. Nastenka is very happy with such a reception. She thanks the invisible Master for his care and goes to bed. Fairies cover the girl with a soft swan fluff blanket and she falls asleep. The Beast appears. Making sure that Nastenka sleeps, it is lovingly watching the beautiful guest. Suddenly Nastenka wakes up. Seeing the terrible Beast in front of her, the girl tries to hide her fear, but the gentle look of the Beast soothes her. Soon Nastenka gets accustomed to the ugly appearance of the Beast: they walk together, have gentle conversations in the park of the fairytale beauty, surrounded by dancing butterflies and fairies. The sick father lies in bed. Nastenka rushes to him. Older daughters have no time to help their father, they are busy with grooms and outfits. They do not want to let their younger sister go: who will take care of a sick father? To detain her, treacherous sisters put the clock back. However, Nastenka’s soul is restless. Feeling trouble, she puts on a ring and a few minutes before the specified time returns to the island to the Beast. The beast suffers from loneliness. Time is running out, but Nastenka still is not there. He loses strength; his eyes darken. Embracing his favorite scarlet flower, he loses consciousness. Nastenka finds herself in a terrible dense forest. A fierce thunderstorm and a rain prevent her from moving on. The servants of the witch are trying to knock her off the road. Nevertheless, having overcome all the obstacles, she comes to the mound on the meadow where she planted the scarlet flower, and sees the Beast embracing it. The Beast does not breathe. Trying to revive him, Nastenka calls him, hugs him and kisses. This very moment, a bright flash of lightning suddenly lights up the sky, and thunder shakes the earth. Nastenka loses her senses, and the enchanted Beast begins to rise throwing off the animal hide and turning into a beautiful young man. The spell of the wicked witch is over. The Prince Charming hugs Nastenka and kisses her. Everything transforms. Garden is full of paradise flowers, butterflies fly in it, the palace glitters in the rays of the morning sun. Guests from all over the world come to congratulate young lovers. The father blesses them, and the insidious sisters beg for forgiveness. Soon there will be a wedding in the palace! Nastenka and the Prince Charming thank the magic scarlet flower, a symbol of love and fidelity!